All About Cats September 23, 2018 5 Comments on Why Do Cats Purr? We all know that precious, calming sound of your purring feline friend. Surely, it must be because your little ball of fur is happy and content, right? Well, not always actually. 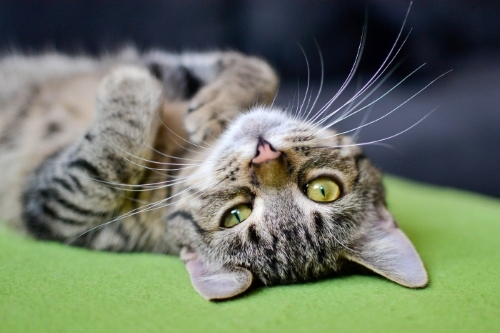 Cats purr – but why? Nobody is quite sure of why cats’ purrs exactly. We have come to connect the purring to happiness and contentment, but that’s not always the case. Sure, many cats do purr when they are cuddling up to their human or when basking in the sun, but cats can also purr to express stress, fear or nervousness. It is believed to be a way of calming down in a stressful or difficult situation. For example, a visit to the vet or when going into labor, the former being a way of self-soothing and the latter being crucial for survival of the kittens in early days. The kittens will begin purring when they are only a few days old. This helps the mother to locate them when they need to be feed and is a means of communication. Since kittens are born blind and deaf, they rely on the vibrations from the purring their mother will send out. The purrs will lead the kittens to the warmth of their mother and to help them feed. When a kitten is eating, they do something called a milk thread. This is when the kittens press and flex out their paws to stimulate the milk flow from their mothers, and it is very common for the kittens to purr while milk kneading. 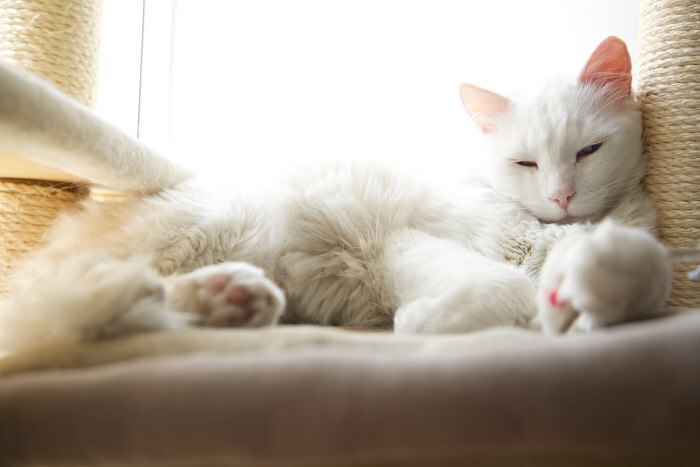 You might have seen your own adult cats purring and milk kneading on a soft object in your home, such as a pillow or blanket. If your cat is doing this, you can be sure that they are content since this reminds them of the time they were snuggled up safely next to their loving mother. This very much explains the happy side of the purring. 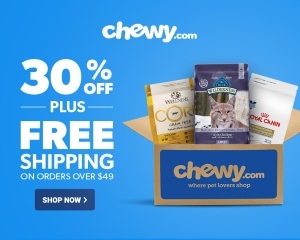 The solicitation purr is a purr and meow combination that many adult cats use to attract our attention, most commonly when they want to be fed or perhaps snuggled. This purr combines the pleasant, contented purring sound with the high frequency meowing to get their humans’ attention quickly. The solicitation purr is used for different kinds of situations, but as mentioned earlier, it is most common when the cat is hungry. It is also common for cats to use this purr to wake up their humans, probably when they think we have slept way over breakfast time. This is compared to the way babies cry to get their mothers affection, which goes to show how well our furry friends have adapted to living with humans. The purrs of a cat are produced by using the larynx (the opening to the windpipe where the vocal cords are located) and the diaphragm. The purring happens during both inhaling and exhaling. Not all cats pur, however. While all domestic cats and some wild cats might purr, lions, tigers and jaguars do not. Cats that can roar can not purr, and cats that can purr can not roar is the general rule of thumb! This is because our domestic cats have a small bone inside their vocal cords, while roaring cats have a flexible bone. This flexible bone makes it possible for big cats to make a loud, roaring sound, while the hard bone in our domestic cats only allows air vibrations that produces the purrs. 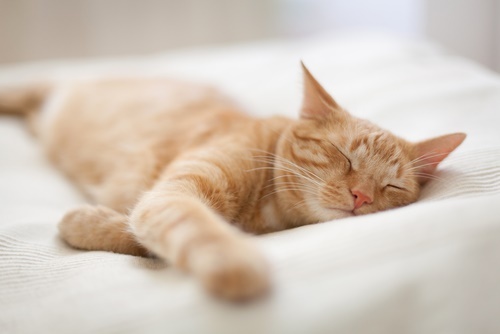 It is believed that the vibrational frequency of the purrs, between 25 and 150 Hertz, can improve bone density and help to heal bones and muscles. There are also reports that state that cats heal much faster than other animals that do not purr, because the endorphin release from the purring. This vibrational frequency is believed to be the reason why cats purr when hurt or sick, since endorphins reduce pain while healing takes place. The purrs of a cat can surely help a cat heal better, but it can also be beneficial to us humans. Pets overall are good for a person’s health, since it helps encourage a healthy lifestyle and work as a stress relief and good company to cheer you up whenever you might feel a bit blue. But scientific evidence suggests that the purrs of a cat can also be specifically beneficial to human health. The frequency of the vibrations coming from the purrs are the same as the frequency used in vibrational therapy, promoting rebuilding of tissues. This kind of therapy also helps to heal infections and swelling, as well as joint pain. The vibrations of the purrs can also lower stress, which I am sure that you know of if you have ever had a sleeping, purring cat in your lap. Lowered stress goes hand in hand with lower blood pressure as well as reducing the risk of having a heart attack (cat owners have 40% less risk of having a heart attack!). So now we know that the cats’ purrs are complex as well as powerful, but not any less comforting and relaxing. 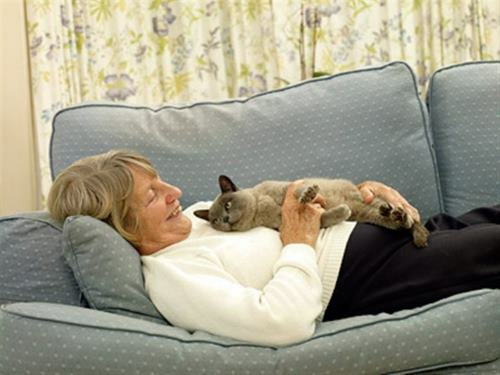 The purrs comfort and release endorphins in both the cats themselves and the humans around them. We are lucky to be able to be a part of the benefits of the sweet purrs and affection from our beloved furry friends! Cat purr is soo calming! Love cats and great text! I didn’t realise there was so much to know about purring!! Nice to meet you Mew!